Microsoft and Hewlett-Packard took marketing and sales staff to Africa's iconic Victoria Falls for a team-building and reward trip. Pre-event planning: Microsoft and Hewlett-Packard (HP) run two pan-EMEA events each year for marketing and sales staff working together on hardware and software products. 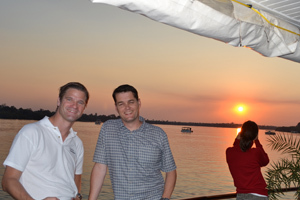 After appointing Corporate Rewards to run the summer event, Zambia was chosen as the destination in January and the agency carried out a site inspection in April. The focus of the trip was team-building and networking as delegates were from seven different countries, and the aim was for them to develop strong working relationships. Challenges: According to Corporate Rewards business development director Daniel Kelly, the key challenge was to ensure that all the delegates left the trip having not only built bonds with their colleagues from across Europe, but also with an unforgettable experience. At the last moment, the World Health Organisation announced that Yellow Fever jabs were required for anyone passing through South Africa - which all flights did - so the innoculations had to be organised at speed. Solution: The trip kicked off with a business-focused meeting at the Royal Livingstone Hotel, before delegates began a programme of exhilarating activities, including white-water rafting after a 230m descent down the Batoka Gorge, feeding elephants and canoeing. Post-event analysis: Questionnaires were emailed to the client and to the delegates themselves, with feedback noting the trip created "great shared experiences for the EMEA teams". Microsoft director Jesper Westfall adds: "We recognise the clear business benefits of incentive trips. They provide an incentive for the HP and Microsoft teams to work together to achieve a common goal."